The 2015 Sonata features a more mature look that is associated with the Genesis. Earlier this month, Hyundai told the world that they would be bringing the newly redesigned 2015 Sonata to the New York Auto show in April. In case we didn’t get the memo clearly enough, they were all too happy to offer up two unique renders of the next Sonata, including a shadowy peak at its exterior styling and a considerably brighter look at its interior. In Hyundai’s preview release, it’s noted that the Korean version of the 2015 Sonata will be revealed in its home country later this month with the New York unveiling of the U.S. version to follow. Hyundai has already begun taking preorders for the new Sonata in Korea as of March 5. Based on what is available for prying eyes in the 2015 Sonata teaser, the new sedan has a more mature look to it, bearing a closer resemblance to the brand’s Genesis. Given the Genesis’ popularity and penchant for luxury, this can only be a good thing. “Some customers often used the word ‘shoddy’ about our midsize sedans when compared to European rivals. So we adopted a smooth and natural approach to the new Sonata’s exterior design to shed that image,” Hwang Chung-yul, Hyundai’s vice president for product management, told Wall Street Journal. 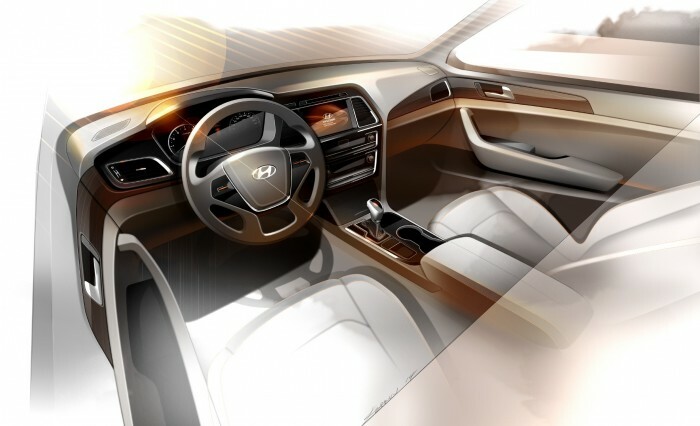 The interior of the 2015 Sonata is luxurious and inviting with the comfort and technology it offers. WSJ also reports that the 2015 Sonata will be better on fuel economy, utilize high-grade steels, and have a longer wheelbase and roomier interior. Based on what you see, are you interested in the 2015 Sonata, or will you be looking elsewhere for your next midsize sedan?